Possessing the greatest potential to further raise HKBU’s good reputation globally. Shortage of human organs for transplantation has long been a challenge worldwide. Underpinned by researches on narrative persuasion and health communication by Dr Timothy Fung from School of Communication and the animation expertise of Dr Kelvin Lee from the same School, an animation was made to tackle the problem. The animation has contributed greatly to public health and public service. Entitled “Say your wish, save a life”, the animation integrates professional knowledge of medical doctors and organ transplant coordination. 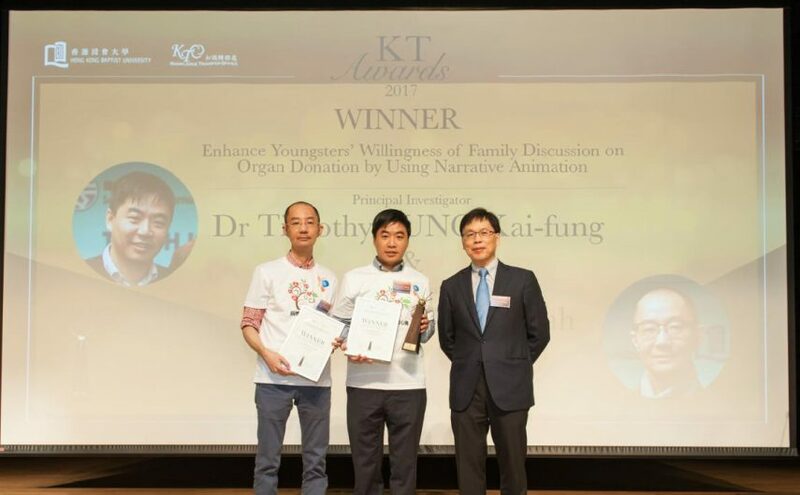 In view of both academic and practical merits, it was adopted by the Hong Kong Food and Health Bureau in its citywide “Say Yes to Organ Donation” campaign. The animation was broadcast on the Organ Donation Promotion Vehicles campaigning at all the 18 districts across Hong Kong. The project was also highly praised by the professional Hong Kong Society of Transplantation. The Society has since adopted the animation in their education talks to the public. This animation project is an exemplary case of yet another research by HKBU faculty members which makes huge impact outside academia.